OK, this is the direct link to figure 1 of Krauss' commentary paper. I just want to run through what seems to be happening and some of the consequences. Best to have the picture open alongside Hyperlipid. Top left is the nucleus, then there's the stack of endoplasmic reticulum, then a newly synthesised lipid particle stuck on the outer surface of the ER. There is an interesting initial particle labelled I receiving "lipids" (another post there) which goes on to become that unlabelled particle on the outer surface of the ER (call it a nascent lipoprotein). The nascent lipoprotein has two arrows leading away from it representing two metabolic options. The upper arrow goes to a particle labeled III. On this pathway the particle receives saturated fatty acids which, at step V, stop it being destroyed. Destruction is termed PERPP, and the line from PERPP has a flat end meaning its blocked, and the legend "+SFAs" is shown as doing the blocking (by the little curved arrow). Got it? This SFA loaded particle is exported as an IDL (bad) or a large LDL (good). Luckily the IDL appears, on this diagram, to convert to the large form of LDL. But IDL may only be bad if secreted post prandially, I don't know, life is so complex in the ad hoc world of the lipid hypothesis! Summary so far: Basic particle plus SFA gives the "good" version of "bad" cholesterol. Don't you just love these terms. Now go back to that nascent lipoprotein and follow the alternative pathway shown by the downwards arrow. This leads to particle labeled IV, having accepted a lipid droplet via the curved arrow. Remember the lipid droplet. It might matter later. Anyway, there is then a dashed arrow showing possible secretion of this particle. If secreted it becomes a large VLDL particle. While large LDL particles are good guys, large VLDLs are not. In fact they are the precursor to the evil incarnate particle, the small dense LDL. Like Darth Vader, only without the pre death conversion to the good side. Secrete and die. Fish oils to the rescue! There is an arrow from the PERPP "destructaparticle" system pointing straight to this evil particle, joined by a little "n-3 PUFA-ox" which destroys the evil large VLDL before it ever gets secreted. Less of the large VLDL means less of the small dense LDL. More joy on blood results. Not only do triglycerides drop, it's the evil fraction of triglycerides which drop. To summarise this pathway: Basic particle plus lipid droplet gives you bad VLDLs and small dense LDLs, unless aborted by omega 3 lipoxidation product (malondialdehyde is claimed but I'll get on to signaling molecules eventually). All of that is pretty straight forward but it doesn't give us any insight in to anything except how to improve lab numbers. Here are the nitty gritty questions. 1. Where did the SFAs come from? This is easy. Just follow Krauss' refs and you will find it's diet. Another post there needs writing. 2. Where did the lipid droplet come from? Well, lipid droplets in the liver vary from normal physiological amounts through to hepatic lipidosis. Hepatic lipidosis is a routine feature of the metabolic syndrome. We know that fructose is converted to lipid as rapidly as possible in the liver. We know that insulin inhibits the release of all VLDLs from the liver. Combining fructose with a glucose source (to raise insulin) seems a good way to generate hepatic lipid and block it's release. The bigger the dose and particularly the more continuous the ingestion, the more lipid droplets are likely to form. Sucrose or HFCS would do the job nicely. So might alcohol. Alcohol is interesting. Low doses improve insulin sensitivity and high doses do the opposite. The histpathology of non alcoholic hepatic steatosis is indistinguishable from alcoholic steatosis. They are the same condition. Keeping those lipid droplets in your liver seems a good way to get hepatic lipidosis and subsequent cirrhosis. 3. Where are the lipid droplets going? Well, if you dose up on fish oils the answer is nowhere! Lipid droplets should be off-loaded as small dense LDL precursor particles, the large VLDLs. You're not going to release them if you're on high dose fish oils! So you are trading the drop in "bad" LDLs for a rise in hepatic lipidosis. Are you going to mangle your liver to make Krauss happy? Yes? 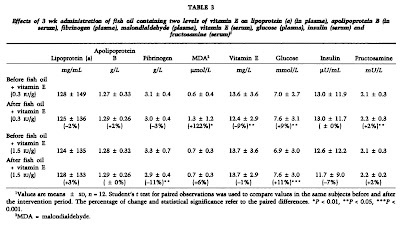 Now let's go back and look at the high dose fish oil study from back in 1991. 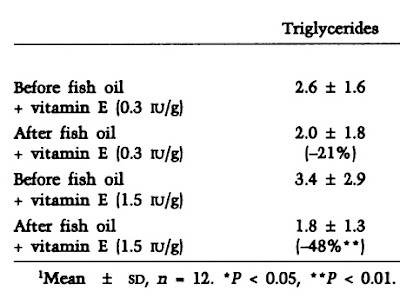 Here are the triglyceride effects of 30ml fish oil a day for three weeks. Without vitamin E some omega 3s still get to the liver and trigs (probably large VLDLs in this case) drop from 2.6 to 2.0mg/dl. Modest and not statistically significant. Have a wash out period and do it again, but this time preserve the omega 3s with vitamin E. The drop is 48% this time, p<0.01, enough to warm the cockles of a cardiologist's heart. Remember, these absent triglycerides should have contained lipid droplets which the liver wants rid of. I find it fascinating to see that, in the post washout/pre omega 3+vitamin E session, that the trigs were up at 3.4mg/dl, quite a bit higher than the 2.6 at the start of the study. Is this the liver off loading lipid droplets retained during the first section of the study? With trigs down at 1.8mg/dl by the end of the high dose vitamin E section, how much hepatic steatosis is going on? Now look at this table, especially insulin and glucose. You'll have to click to enlarge. All of these FBG values are scarily high, so these volunteers are on the edge of diabetes. What happens when you load up on fish oils? Insulin: No significant change at any time. FBG; both fish oil sessions show increased FBG! For low dose vitamin E section the change had p<0.05, for the vitamin E protected phase it had p<0.001. That smells of insulin resistance to me and hepatic lipid overload is the easiest explanation. Aha! So the Greenland eskimo, who refuse to die of cancer on 15g/d of EPA+DHA, must all have been dropping like flies from hepatic cirrhosis. Or type 2 diabetes. Apparently not. This dose of fish oil appears to be fine, just so long as you are not making lipid droplets in the first place. That means no sugar and no excessive alcohol. Remember modest dose alcohol improves insulin sensitivity, so zero alcohol is not needed. The Greenland eskimo were VERY low carb. So where does that leave fish oil supplements? I think if you have a problem with alcohol they are very bad news and you should be absolutely minimising all forms of PUFA, unless you really want cirrhosis. If you are eating to the ADA or AHA sucrose ladened guidelines and already have "mysterious" raised liver enzymes, you will make an already appalling job worse. If you are LC and low PUFA in the first place, or even just eating a diet which doesn't generate hepatic lipidosis (minimal sucrose), I think there are advantages to modest dose fish oils for long term changes in insulin sensitivity (another post needed). Dropping your triglycerides in the short term is not one of them, unless you are in to treating numbers, in which case; come back torcetrapib, all is forgiven! PS Let's just clarify: There is no "good" or "bad" bad cholesterol. You can fuel your metabolism with saturated fat, and the "good" bad cholesterol goes up as a marker. It's the saturated fat which is really good. Or you fuel your metabolism on sucrose, which raises "bad" bad cholesterol. Stuff the cholesterol. It's a marker you are being evil to your metabolism by eating sucrose, which is what does the damage. Peter You wrote: "The histopathology of non alcoholic hepatic steatosis is indistinguishable from alcoholic steatosis." "Glyceraldehyde-derived AGEs were detected in hepatocytes of the patients with NASH, but scarce in simple steatosis"
Has fructose something to do with these "glyceraldehyde derived-AGEs"? Not gone that far. I'd assumed NASH was a combination of excess omega 6s (to lower cholesterol don'tchano) and fructose. So back to glycoxidation again. Seems logical. I could not access the full text of the Angiology article you linked to from the word alcohol in this blog entry. Do you know the author’s definition of “occasional”, “mild”, “moderate”, “heavy” alcohol consumption? If you just pubmed alcohol and insulin sensitivity you will get a plethora of hits. 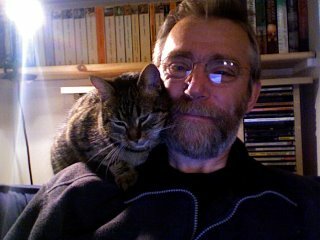 I've not chased the amount as I don't have the opportunity to indulge, with Squiggs at the age he is. This paper used 25g ethanol in 250ml white wine in a cross over design. That's 175 kcal of ethanol to convert to lipid. It's no problem. Compare that to drinking a Starbucks chocolate cream chip with whipped cream Venti at 69g of sugar. It's socially acceptable to consume the Starbucks syrup three times a day, with some healthy fruit juice between times and maybe a token piece of fruit for extra health. The problem with alcohol, like sucrose, is when it becomes a primary calorie source. Going there is a Bad Idea. Very cute rats BTW. As soon as my son is old enough we'll be back in to pet rats! This comment doesn't have anything in particular to do with your post... I've been meaning to ask you a question. Recently, I've been exploring the relationship of the 5-Lipoxygenase pathway and its products to CAD. There's a huge literature out there. Most of my posts on the subject are in the Boswellia thread at Dr. Davis' TrackYourPlaque.com forum. My question is this... It seems to me that the question of the impact of arachodonic acid on heart disease cannot be truly considered without looking at the impact it has on the "5-LO" pathway. OMG. People keep beating me to it. Hee hee, there's no time to keep posting. Yes 5 lipoxygenase is crucial to the deliberate oxidation of PUFA (mostly omega 6 I think) by macrophages to assist the formation of foam cells. When I finally get on to response to injury and hyper response to injury, 5-LO is a crucial enzyme. It's then a question of whether you consider foam cells to be good or bad, in "correct" circumstances or when present in excess due to a huge omega 6 overload in glycated lipoproteins. Ultimately, we didn't evolve 5-LO to kill ourselves, we grew grains and developed margarine to do that! With jam too of course. I agree, big literature out there. In the US a standard alcoholic drink consists of 0.6 oz (17 ml) of pure alcohol. The following represent one drink – 12oz of beer (5% alcohol), 5oz of wine (12% alcohol) or 1.5 oz of sprits (80 proof = 40% alcohol). Moderate drinking for a male is 2 drinks per day everyday. Some studies specify moderate drinking for a female to be 1 drink per day everyday. Some studies do not distinguish between male and female. Generally speaking, moderate drinking seems more beneficial for males than for females. Binge drinking to the same average level as “moderate” drinking does not bestow the same benefits as moderate drinking. Science Daily publishes dumbed down summaries of various studies and the information is freely available. This is not the serious stuff that you typically link to but the original studies are referenced and if you have access to those publications (most of which I don’t) the original paper is available. That post made my head hurt, great stuff though. I like that you brought it back to empirical endpoints with the FBG and trig data. What do you think about the 4g fish fat the Kitavans are consuming? I wonder if the ratio of saturated to polyunsaturated fats makes any difference. I'm definitely skeptical of the recommendation to drink a tall stein of fish oil every morning for your heart. OK I'm exaggerating, but doesn't it seem like the numbers keep going up? Over the past few years I have read about the cardio-vascular benefits of moderate alcohol use, but I was still surprised by the number of positive studies referenced at ScienceDaily. Perhaps the “total mortality elephant” (thanks Dr Kendrick!) is sitting in the room but that’s not being reported in these summary articles, except some mention of increased cancer risk for females. Unlike the statin researches I wouldn’t think these guys were under the influence of “Big Alcohol”. I would think that a doctor researching alcohol would initially be skeptical of any benefit and quick to point out any down side. But without access to the root studies (total mortality data if it exists) I can’t say anything with much confidence. I’m a low carb guy who is so adverse to Omega 6 that I try to get all my animal products from grass fed sources, cook with coconut oil and ghee, etc. As you mentioned somewhere in your blog, the Goth’s at the recent rock concert you attended have more in common with everyone else than we do. A lot of data has convinced me that this is a far healthier way to eat than is commonly practiced through out the world except perhaps by some native populations and IT TASTES GREAT!!!! Hopefully, I am gaining some cardio-vascular and anti-cancer benefit from my diet and lifestyle. Hey it’s even possible that the alcohol cardio protective effect does not apply to someone with my diet and lifestyle, after all, that’s not the diet and lifestyle of the people in these studies. Sorry about the head hurting, any glaring mistakes? That 4g/d on Kitava seems pretty good to me. I think the fish eating Bantu were around the same level too and both groups seem to have slightly better CV health than the Greenland eskimo, who's blood pressure increased with age very similarly to the vegetarian Bantu and Europeans. The Greenlanders were at 3% of calories from carbs (from memory), quite a lot lower than the OD 50 ish g/d. The vegetarian Bantu seem so on the edge of all sorts of problems with their extreme carbohydrate intake, it amazes me they are as healthy as they seem to be. No wheat, no sugar? Perhaps we should be cautious of very extreme diets. I'll stick to balanced nutrition from the OD! Mind you Philip, some of the Goths I know are quite interesting people in their own right... My daughter is now a LC gluten free Goth! The oxidized PUFA are also a part of diet--as a consequence of frying, I have read papers saying that even ghee gets higly (pero)oxidized. How are the dietary oxidized PUFA handled in body? This comes down to very similar decisions as to the importance of dietary AGEs, where the camps are clearly split between the rawfoodies and the food industry. I find it hard to sort out the truth. The roll of oxidised lipids in the diet seems relatively unimportant to me. They are, by and large, polar molecules, usually aldehydes or alcohols and I wouldn't expect them to be being assembled in to chylomicrons. The dietary triglycerides are broken down in to free fatty acids during digestion and carefully reassembled in to new triglycerides for export in chylomicrons. I doubt this system would mistake a nine carbon aldehyde for a 16 carbon fatty acid... Of course it might. In which case ghee would be highly artherogenic. Which it's not, as far as I can see. Great post--I printed this one out and want need to re-read it a couple of times (like a good movie, to catch all the details). Could the omega-3 PUFAs be replaced with omega-6 and that would induce PERPP? Meaning is that how linoleic acid lowers cholesterol? (or does it?). I didn't see any mistakes; the headache just comes from trying to wrap my brain around the metabolism nuts and bolts. What you said about PUFA intake makes sense. Thanks for the insights. I have been trying to tease apart why my FBG has been leaping to new heights lately. I've been on a Paleoish diet and had had really stellar FBG and sometimes even rather lowish PP BG at times. Then all of a sudden I'm getting morning readings in the 90-110 range and I'm freaking out. (I'm not a diabetic, just curious about these things). Then you posted this article and I put it together... I've been taking large doses of fish oil. First it was 5g a day then recently I bumped it up to 8g. I have an autoimmune arthritis that is supposed to be helped by fish oil (not that I could ever tell however). So today, after 24 hours of no fish oil, I had a FBG reading of 79... vastly lower. It's only been one day and I'll get another data point tomorrow but wow, I had no idea fish oil could bump up my FBG like that. I am grateful to you for posting this! Smart man! You always explain things in such an interesting and entertaining way. So basically omega 3 (perhaps PUFA in general?) makes the problem worse, but doesn't cause the problem alone... sort of similar to fat consumption in general? (Dietary fat: not a problem if you aren't mainlining sugar, BIG problem if you're eating too many carbs, because dietary fat prevents glucose from easily being accepted for energy, necessitating insulin increases and all that nastiness). Is this hepatic steatosis more likely caused by omega 3 than omega 6 or are both problematic? If omega 3 is no worse than omega 6, considering most people mainline corn oil it can't possibly do harm to take omega 3 supplements if it is replacing the fat one would otherwise consume from mayo and stuff... regardless of the carbohydrate level of the diet. The insulin level did seem to decrease after every stage. 13, 13, 12.6, then 11.7... inflammation is related to insulin resistance, insulin resistance is partly indicated by insulin level (which, in a cycle, is further inflammatory). Seems beneficial to me to reduce inflammation as that will reduce IR, and insulin, which will reduce inflammation, etc. This is a fascinating post! I understand now why did you ask about the Lyon study! The mechanism that you described indicates that the "benefits" of the omega-3 supplementation may be illusory or coincidental. I used to take it for granted and proven but it shows, we should be a lot more skeptical about everything. I still think that there is a dramatically positive (and documented) effect of the DHA and EPA on human neural system, especially on children, but the effect on cardiovascular could well be coincidental. It is quite possible that the benefits of fish consumption and omega-3 oil consumption may be in fact coincidental and due to a displacement of sugar and starch. How often do we feel like eating something sweet after eating fish? It could be the same effect with nuts. In retrospect, I think your comment about Lyon study and sugar may be in fact spot on! Hi Nice Blog cardiovascular system works,Your body needs a constant supply of oxygen to function.The cardiovascular system information (CV system) is responsible for getting oxygen into your body, and delivering it to the tissues that need it. Really interesting Peter. There's a connection here to my Hep C (HCV) research. This common blood-borne virus infects the liver and persists by piggy-backing on lipid transport cycle. It's dependent on DGAT1 (think fructose restriction and low carb), needs VLDL expression to get out of the cell (think SFA and maybe fish oil), and infects new hepatocytes via LDL receptor (think PUFA restriction in general). Higher LDL counts are associated with better outcomes. Add to that the hepatoprotective effects of SFAs, DHA, choline, protein, plus carb (especially fructose/sucrose)restriction, throw in a few polyphenols, supplement selenium, zinc, Mg if necessary, avoid gluten and grains in general, eat lots of nutrient-dense animal foods, and you'll eventually have a benign low-grade infection you won't even notice. That's the theory, it's worked for me, seems to help other people too. AGE RAGE and ALE: low fat!